Believing you since 2003. We’re the BEST, the BEAUTIFUL, the ONLY Ghostbusters of New Jersey! Ghostbusters New Jersey is the Garden State’s leading paranormal investigation and elimination service. We strive to provide all of New Jersey with the high level of customer satisfaction that they have always expected of GBNJ. We also work closely with our “sister” franchise in Delaware. 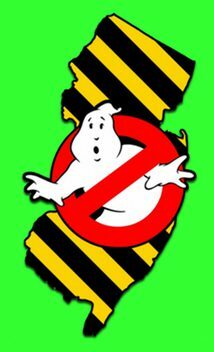 GBNJ has used a variation of the the No Ghost logo superimposed over the state of New Jersey since 2004, our current logo is just the third redesign since our founding in 2004, talk about consistency! 7/14/16- Proton packs, slime-blowers, a fully customized ecto-mobile, and a pop tune that’s haunted humankind since 1984. Looks as if somebody called the Ghostbusters of New Jersey. 6/10/2016- It’s 9:30 p.m. on a Wednesday night in Williamsburg, and I’m watching three grown men walk down a quiet side street, sporting Ghostbusters jumpsuits and what appear to be functioning (“functioning”) proton packs. Newark – Who knew that Newark had it’s very own Ghostbuster Squad? On Saturday evening we caught the paranormal investigators outside the old abandoned Super Fresh in Newark’s Fairfield Shopping Center, vacant since 2015. * If you are interested in joining GBNJ as a member contact us. **Ghostbusters NJ isn’t, can’t and will not be held responsible if you or your franchise’s paperwork and permits aren’t in order.